I’ll never get a tattoo. On some people it looks great; it meshes with their personality. We all know what it looks like on the other portion of the population. Aside from the fact that I don’t wish pain upon myself (the other reason I’ll never get plastic surgery… unless medically necessary, as it was to repair my chin during the ear-piercing fiasco of 2004!!! ), I can’t help but to change my mind with each passing minute. I’m not sure there is anything in this life – people excluded, but portrait tattoos really creep me out – that I’ve loved steadily enough to wish it upon myself daily. Even the color pink. 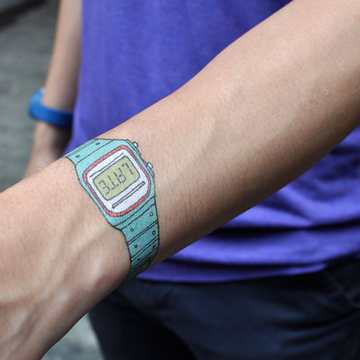 That’s why these grown-up fake tattoos are so awesome!!! Especially the watch. Actually aside from the funny/hipster -my-skin-color-is-a-pantone-color-therefore-I-am-cool tat, there is not much to desire. But this does represent what could turn into a very successful breakout genre of body art. And on days when I don’t feel like receiving a constant message about how I am late… presto… washes off with water! Although my watch would say, “12 minutes later” since that’ what I set all my clocks/watches/phone/computer to anyway!